What a weekend we had! It was filled with egg dyeing, visiting with my parents, celebrating at church, egg hunting, and general fun. It's no secret that I'm striving to be more intentional this year, and that includes the way we celebrate holidays. More than anything, I want Micah to know that Easter is about more than a fictional bunny that delivers candy in the middle of the night. It's about more than new clothes and egg hunts and yummy food. It's about a risen Savior. That changes the way we approach a lot of things in our home. For one thing, the Easter bunny doesn't know our address. Micah still received a basket of small gifts, but it came from her daddy and me. We still dyed Easter eggs because we can use them as object lessons for the new life we have in Christ, and yesterday afternoon, Micah hunted plastic eggs in the yard because empty Easter eggs are a great way to convey the message of an empty tomb. We're trying to be thoughtful about the traditions we practice and honor in our home. For us, it's worth it to sacrifice the Easter bunny because it allows the cross and subsequent empty tomb to be the center of our Easter reflections. At any rate, the way we celebrate Easter may be a little different than most American families, but it works for us. Here are some images from the weekend. Egg dyeing with Micah was a lot of fun. 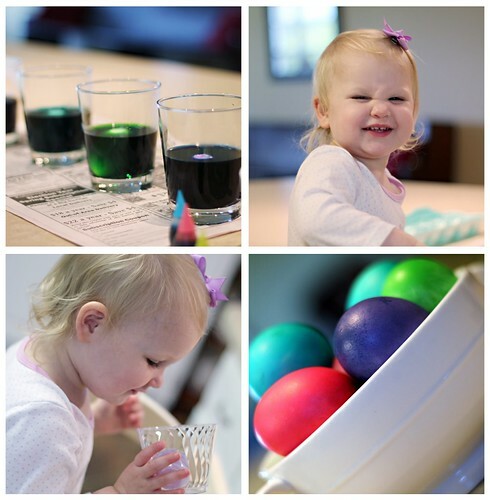 She was patient and interested in the process, and she even "dyed" her own (plastic) egg while I took care of the real eggs. 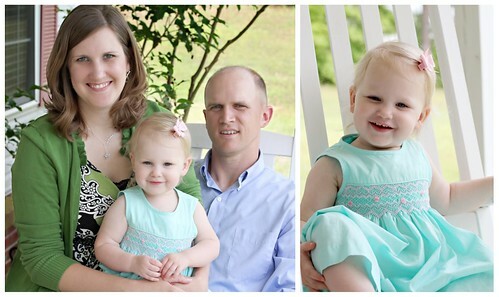 Since my parents were here to visit, we had someone to take our picture yesterday afternoon after church. Yay for a family portrait! 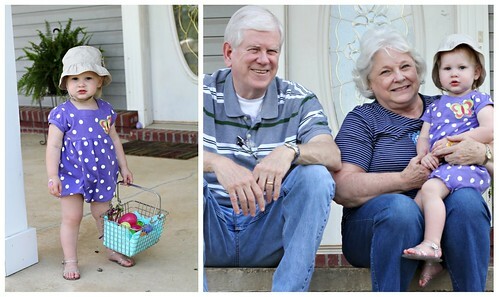 Micah enjoyed hunting eggs for a little while, but she soon lost interest and preferred hanging out with her Nana and Grampa, who took her home with them yesterday afternoon. It's a quiet house around here without my little spitfire, but that also means that I have a little uninterrupted time to do a bit more writing and designing. Hope you all had a wonderful Easter weekend! How did you celebrate? ?